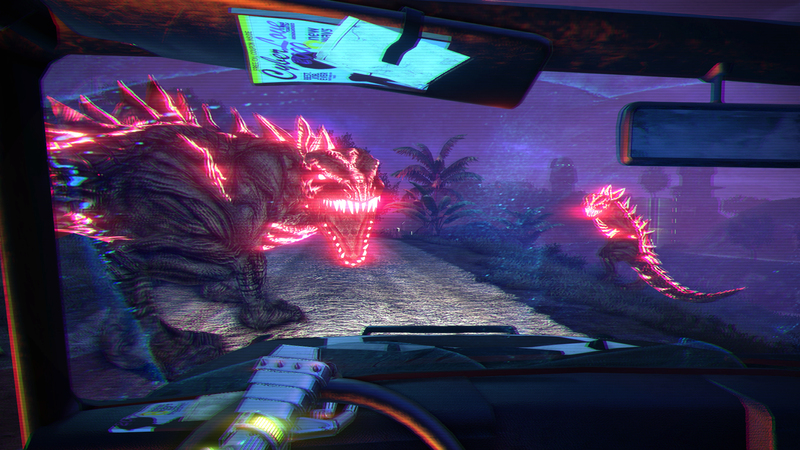 If you had to describe Far Cry 3: Blood Dragon with one word, "obnoxious" would be a good choice, but in this case that label is more of a compliment than a slight. Originally introduced as an April Fools' joke, the game has a cheesy plot, even cheesier voice acting, predictable clichÃ©s and an aesthetic that is absolutely dripping in neon colors and 80s flair. But if you long for the feeling of over-the-top action and faux-futurism that permeated the sci-fi genre a few decades ago, you're going to absolutely fall in love. 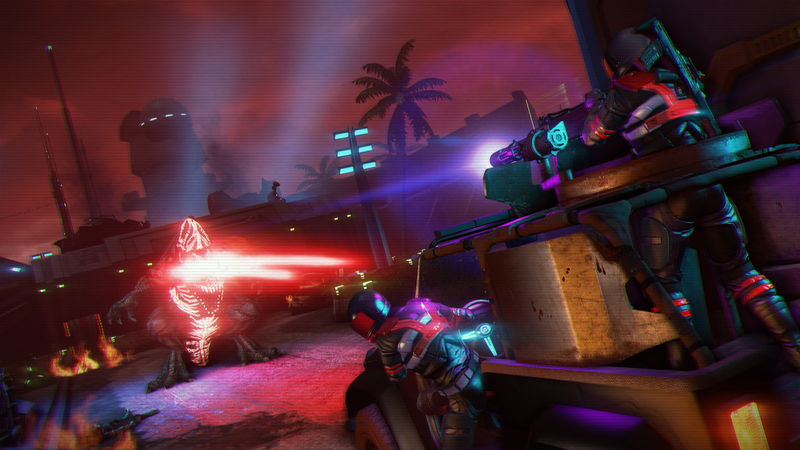 Let's get this out of the way right off the bat: Blood Dragon has absolutely nothing to do with the story of Far Cry 3 - or any other title from the developer, for that matter - and you don't need to own the original game to play Blood Dragon. It is a completely separate, standalone experience. 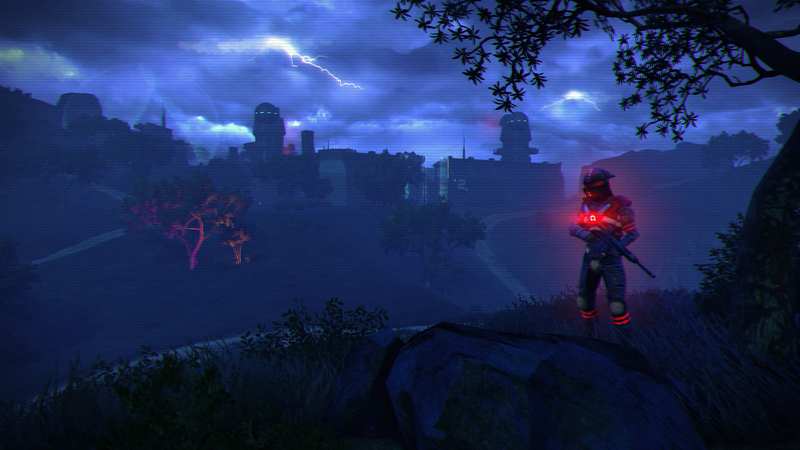 That said, as both Far Cry 3 and Blood Dragon share both a game engine and the same map layout, those who have played the original will feel right at home. Players take the role of Rex "Power" Colt, a cyborg commando with a singular mission: Eliminate a particularly dangerous rogue agent called Sloan. 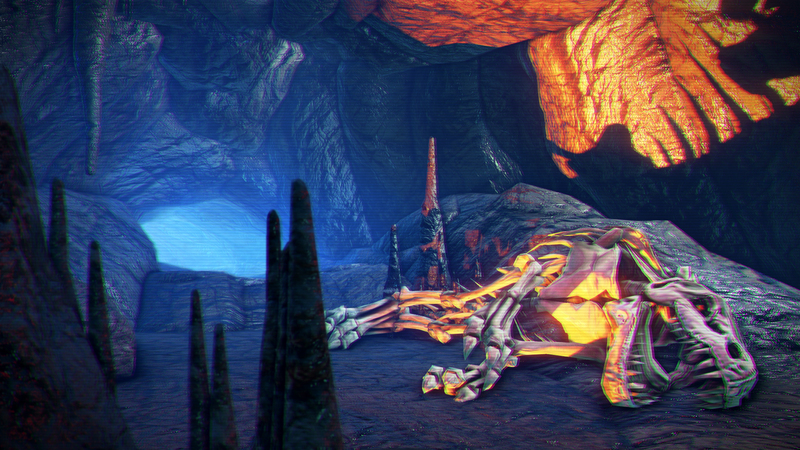 As is the case with the 80s action films it mimics, Blood Dragon's story is a rather disposable vehicle for overly dramatic one-liners and more explosions than you can shake a nuclear warhead at. You'll fight wave after wave of enemy cyborgs that look like they were pulled straight from a G.I. Joe cartoon and be submerged in the sounds of electric guitars and synthesizers. The story missions will push you closer and closer to your eventual showdown with your nemesis, but after a few tutorial missions lay the groundwork of the plot, you're free to explore the island and delay the climax for as long as you see fit. The island is littered with hostile encampments which you can overtake in order to provide additional fast-travel points for quick jaunts around the map. These sections, while rather straightforward, allow you to plan your own unique attacks, which is part of what made the original game so enjoyable. 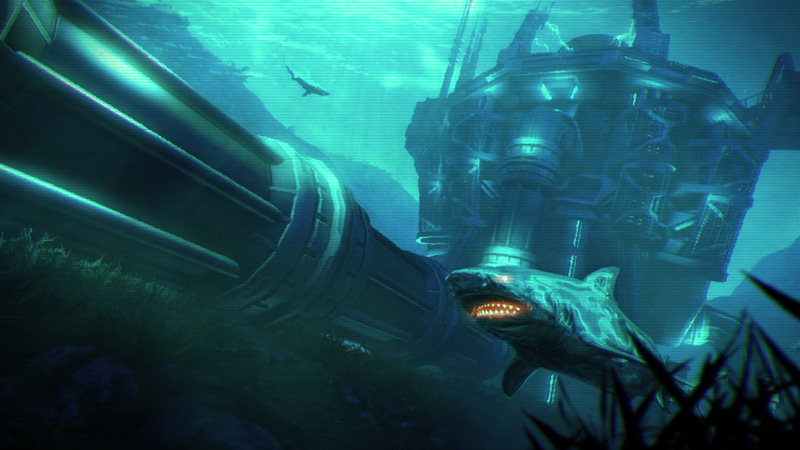 As in Far Cry 3, there is plenty of exotic wildlife to hunt down this time as well, though they've undergone some very distinct neon-colored makeovers. Oh, and there are dragons - Blood Dragons, to be more specific. These glowing, lumbering brutes are a huge part of the gameplay, as the title suggests, and they can at once be a menace to your own existence as well as a useful tool in taking down the enemy. Murdering one of the seemingly limitless cybernetic soldiers that populate the island will yield a tasty "cyber heart" that the Blood Dragons absolutely cannot resist. Tossing one of these gooey blue organs will send all nearby dragons sprinting towards the area, attacking anyone and anything in their path. Lobbing a heart into an enemy stronghold is a sure-fire way to take them down in a hurry, and it's extremely satisfying to see the massive beasts wreak havoc at your own hand. However, the danger factor climbs once the enemies have been conquered and it's just you and a hungry dragon left on the battlefield, and the one-on-one battles with the dragons are some of the most tense and rewarding showdowns in the game. It's a fantastic risk/reward system that is a blast to experiment with, even if it ends up killing you every once in a while. 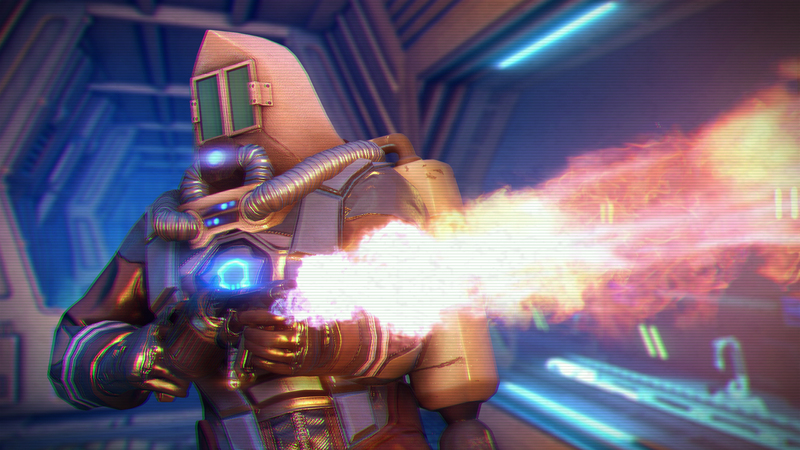 These creatures change the gameplay so drastically that once you master the art of sending them to do your dirty work, you'll wonder why they didn't just name the game Blood Dragon: Killer Of All The Things. However, there are some areas completely devoid of the destructive mega-lizards, and it's in these regions that you'll rely on a number of futuristic weapons such as a glowing assault rifle, a glowing handgun, and even a glowing bow and arrow. But as awesome as all this nostalgia-fueled mayhem is - and for someone who grew up in the late 80s, this is an absolute dream come true - those from later generations probably won't be able to fully enjoy what it has to offer. From the moment the thumping of helicopter blades gives way to a boombox blaring Long Tall Sally, it's clear that this is a game you will either "get" or you won't. The classic quotes and movie references fly with reckless abandon, and if you catch them you'll be grinning from ear to ear, but if you don't you may be left scratching your head. 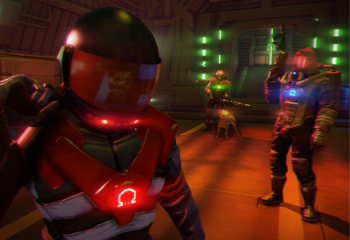 Bottom Line: Even as simply a pure action game, Blood Dragon would be worth a look, but for those who appreciate the retro futuristic style that it bathes in, it's an absolute treat. Recommendation: If you grew up on films like Aliens, Predator, and The Terminator, you simply can't go wrong here. Younger fans of shooters in general will also likely be pleased, though they may not appreciate the humor.